Watch the latest Perspectives Weekly newscast. Association of Players, Casinos, and Webmasters. This video is updated weekly with the latest news from around the world affecting online gambling. The APCW is an always growing community of online casinos, players, affiliates, and others in the industry with the common goal of fighting for honesty and integrity in the world of online gambling. The Perspectives Weekly newscasts are the most watched videos in the industry. This press release from Lucky Live Casino heralds the advent of “Crazy Mondays”, a weekly promotion providing great opportunities for players to win weekly prizes. Any player participating online in any game on a Crazy Monday on the casino’s website, receives a raffle ticket each time he plays €100. Therefore, the more times they play €100, the more opportunities they have of taking home a prize. There is only one prize per week. 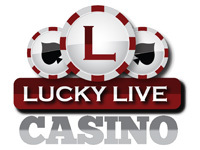 Lucky Live Casino is a world leader in live casino entertainment, they enable you to play at the Fitzwilliam Card Club and Casino in Dublin, Ireland from home. Streamed online from the Fitzwilliam Casino in Dublin, the Technology of Distance Gaming from VueTec Software helps to webcast the live games, in concurrent time to all the members of the Casino. A computer does not generate these games, which involve live action in the Fitzwilliam Casino. Imagine sitting in your own home, and comfortably playing online at the lively, bustling tables of the Fitzwilliam Casino and taking part in live dealer games with real-time buxom beauties, or participating in virtual games, and experiencing the incredible ambiance of playing in a live brick and mortar casino. What an incredible experience! A player holding a raffle ticket issued by this Casino will be eligible for free bonus money to play at the tables of Fitzwilliam casino with the buxom live dealers or receive gifts like iPads, free bonus etc. Only one winner will emerge per week. This new promotion gives every player a chance to win a special gift each week on Mondays, and the opportunity to play against live dealers in baccarat (Punta Blanco), roulette and blackjack (early payout option) and Texas Hold’em Bonus Poker, not to mention all of the slot games. The casino will announce the winner on its Facebook page, via Twitter, and on their winners page. Everyone knows that after the weekend, Mondays are hectic, and everybody is busy. Introducing Crazy Mondays, an excellent incentive for people to play at the casino on Mondays, which is normally an empty day at any casino. This Casinos dedication to live casino entertainment is legendary and offers their members a wide array of internationally acceptable payment and deposit options like Moneybookers, Neteller, PaySafeCard, Visa, MasterCard, Delta Card and the like. They ensure Client Security by using security systems like, 128-bit encryption, VeriSign security, and Technical systems testing for random number checking. These measures give the client a sense of security and comfort in dealing with the casino. VueTec Limited owns this Casino and operates it in conjunction with the Palace Casino located in the Isle of Man and the Fitzwilliam Casino in Dublin, Ireland. The Casino comes under the gambling jurisdiction of the Isle of Man. Casino.com is running a promotion called The Bond Experience for new players in November 2012. The winner of the draw, which will take place on December 7th, will get a weekend holiday for two people to London, New York, or Sydney. This weekend includes a two day rental of an Aston Martin DB9, two nights in a luxury 5 star hotel, dinner and drinks at the city’s most exclusive casino, and the two of you get a day at a Spy Academy where you receive training in surveillance techniques and get to use the latest spy gadgets. You will get a draw ticket for every $50 you deposit at Casino.com from now until November 30th. You don’t have to deposit $50 at a time, if you deposit $200 in one shot you will get 4 tickets to the draw. To enter for this promotion, simply go to this page and follow the instructions provided. You must opt in to the promotion before you make your first deposit, and tickets will automatically be given to you each time you deposit. Looking at the Terms and Conditions for this promotion, there are a few things to point out. This promotion is only available to players who have never made a deposit at the casino. The winner must take the holiday before December 31st 2013, so you have a year to take it before it expires. The budget for the promotion is $5200, so based on where you live, you may have to choose a destination that fits within the budget. The prize cannot be exchanged for cash or bonuses and it is not transferable. Casino.com has been online since 2008 and they have a great reputation, if you would like more information about the casino, read my Casino.com review. By the looks of it, you can still claim the welcome bonus of a 100% match on your first deposit which is always available to new players. The Saskatoon Star Phoenix released a story earlier today (Nov. 5th, 2012) about a former Chief of the White Bear First Nation who is planning to open an online casino tomorrow, named the Northern Bear Casino. Bernie Shepherd plans on running this online casino from his office on the reserve which is about 150km southeast of Regina, and is doing so without permission from the federal or provincial government. At the time of the story, the provincial government had no comment other than the fact that they are monitoring the situation. A few hours later, CBC News released a story stating that Donna Harpauer, the minister responsible for the Saskatchewan Liquor and Gaming Authority (SLGA), has said online casinos will not be allowed to be hosted in Saskatchewan. She apparently said this to reporters when they asked her about the Saskatoon Star Phoenix story. This isn’t the first time that Shepherd has opened a casino without permission from any level of government. In 1993 an RCMP SWAT team raided a casino on the White Bear reserve that was started by Shepherd, who was chief at the time, and other residents of the First Nation. They were charged with operating a common gambling house. The charges against him and the others were dropped, and the incident led to the creation of the Saskatchewan Indian Gaming Authority (SIGA) which now has casinos in six communities in the province, including one at White Bear. Shepherd says he is opening the Northern Bear Casino without any involvement of the Federation of Saskatchewan Indian Nations (FSIN) or SIGA. Running an online gambling company in Canada has always been illegal, but when the people running it are First Nations, things tend to get complicated. One side says it’s illegal, the other side says it’s within their treaty rights. Take the Kahnawake Gaming Commission (in Quebec) for example, they have been licensing, regulating, and hosting online gambling companies for over a decade. There have been questions about the legality, but no charges have ever been filed. The Kahnawake people have basically declared themselves as being a sovereign nation when it comes to Canadian laws they don’t want to follow. The federal and provincial governments in Canada have been relatively quiet when it comes to these issues, and rather than fight against them, they have been opening their own provincially run online casinos. BC and Quebec have their own online casinos, and Ontario was supposed to have one earlier this year but I haven’t heard much about it. Saskatchewan has also been toying with the idea, but who knows when that would ever happen. Things tend to move slowly in this province. It will be interesting to see how this all plays out, I will definitely be keeping a close eye on the news tomorrow and will keep this story up to date with anything that happens. Based on how past events have played out, could this be the start of many Canadian online casinos run by First Nations? Will the government finally decide what the rules are when it comes to online casinos being run by First Nations? Stay tuned to find out. CBC News said she “shut the door on the idea” making it sound like immediate action would be taken if the online casino opened. They were talking more about things said six months ago by Harpauer when the SLGA was considering launching a provincial online casino, than what she said about this situation today. Update – Tuesday Nov. 6th: The Northern Bear Casino has launched and is accepting new players. The casino is part of the GEOBet Gambling Network which is operated by Golden Arrow Entertainment, based in the Tsuu Tina Nation (Redwood Meadows, Alberta, Canada). GEOBet.com was launched in September 2012 and the site offers an online casino, online poker, and sports betting. So apparently the Tsuu Tina Nation in Alberta has been offering online gambling to the world for a couple months already, and I never heard much at all about it. GEOBet is licensed in several jurisdictions including Malta, Curacao, and Kahnawake. Northern Bear Casino appears to just be a simple skin of GEOBet, because when you visit the website, everything you click on takes you to a GEOBet page with just a bar across the top that says Northern Bear Casino. The slots are powered by Microgaming software, and only the instant play games are available, I don’t see any option to download. I don’t really see the point of playing at this new Northern Bear Casino, you might as well just play at GEOBet since it looks like you are playing there anyway. By the looks of things, these casinos will likely be here to stay, and there will probably be many more popping up in First Nations all over Canada. In a rare move, Microgaming will be removing the Lord of the Rings slot and replacing it with The Dark Knight on June 28th, 2012. This is the first time that Microgaming has ever removed a slot, and I’m guessing it is due to licensing costs and/or possible disagreements with the licensee. The Lord of the Rings slot was also changed last year to add progressive jackpots, which is the first time a Microgaming slot has ever been changed. They normally release another version of a slot with progressives added, and they have done so with several different slots, adding the Mega Moolah progressive jackpot which is linked to all Microgaming casinos. I’m sure it had something to do with the license agreement as well. I enjoyed the LOTR slot when it first came out, but when they added the jackpots, they also changed the free spins bonus feature and made it harder to hit a big win. I still played it once in a while, but mainly because I’m a big fan of the books and movies. Microgaming was also planning on releasing slots based on the other Lord of the Rings movies (this slot was based on Fellowship of the Ring), but I’m assuming that is no longer going to happen. 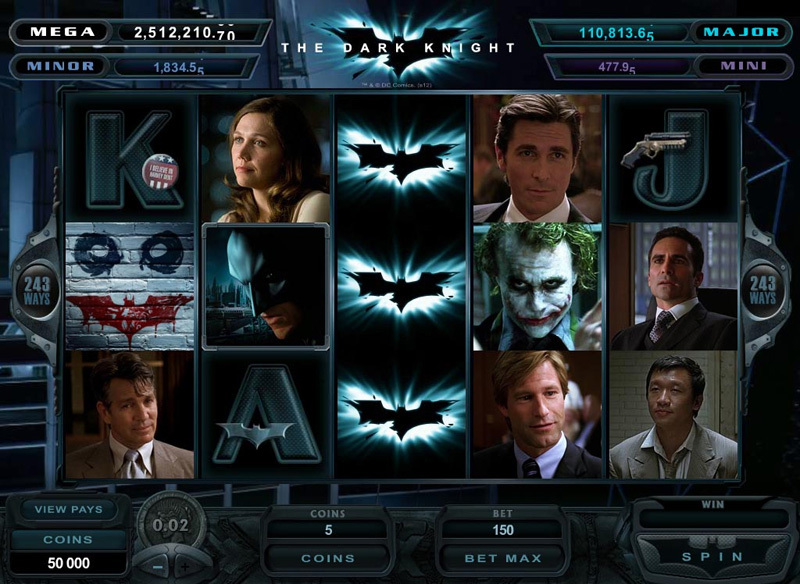 With “The Dark Night Rises” coming out soon, we may see another slot from Microgaming based on that movie. The Dark Knight is quite similar to LOTR, and at first glance I thought they simply replaced the symbols and other images with Batman themed images. 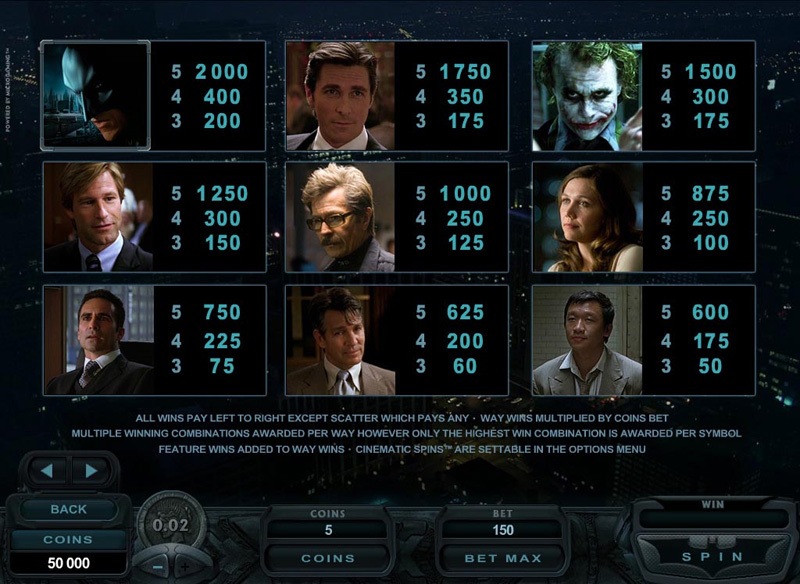 The paytable in The Dark Knight looks better, which is one thing I didn’t like about the LOTR slot from the beginning, I always thought it was quite cheap. It also doesn’t seem to have the “Cinematic Spins” which had clips from the Lord of the Rings movie playing in the background when the reels were spinning. The Mega Moolah progressive jackpots are available on The Dark Knight which has a minimum top prize of a million dollars. 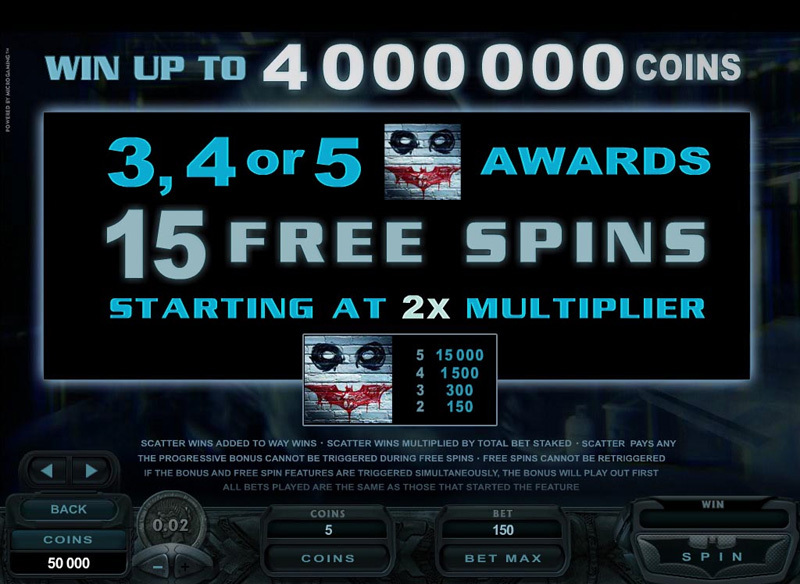 Other similarities include stacked wilds, a free spins feature with 15 free spins starting at a x2 multiplier, and the Batman or Joker feature which is similar to the Gollum feature on LOTR. 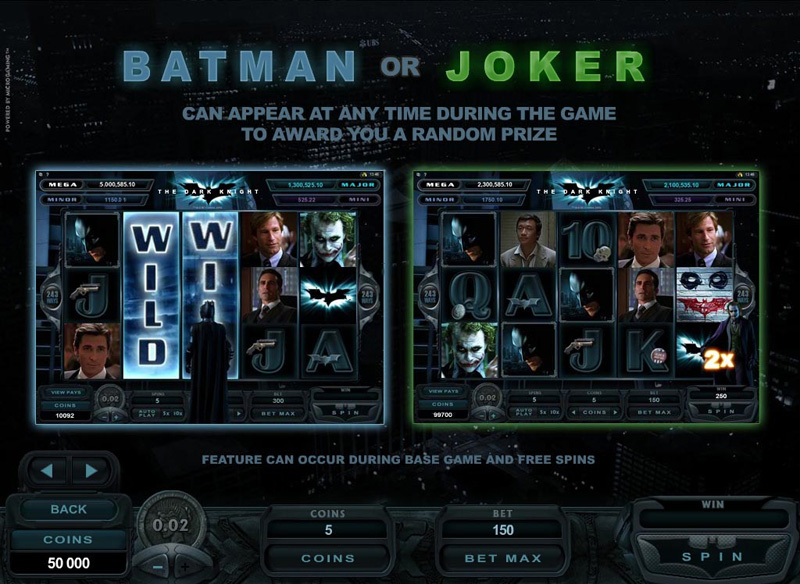 Batman or the Joker can appear at any time during regular and free spins to award you with a random prize, including increasing the multiplier of your free spins, holding a reel that’s stacked with wilds and giving you a free spin, or giving you cash prizes. Other than the improved paytable and lack of movie clips in the background, it is basically the same slot. Since the Lord of the Rings slot was so unique, there really was no point throwing those features out and starting from scratch, so I don’t blame them keeping most of it the same. I am quite glad they improved the paytable, and I am looking forward to trying this slot when it is released. 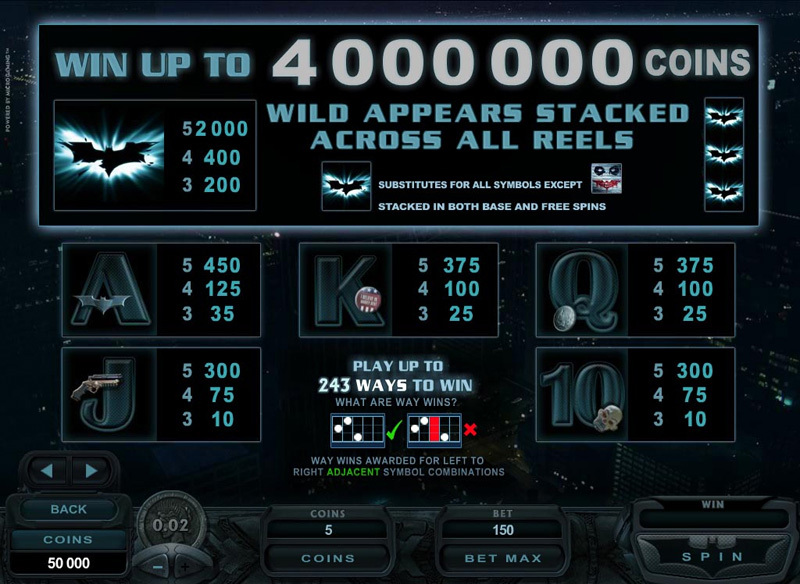 You will be able to play The Dark Knight on June 28th, 2012 at any of these Microgaming casinos. Update: I guess I was mistaken, it is pretty much the exact same game as the LOTR slot. The only difference I noticed was with the Batman or Joker feature – Batman adds wilds to the reels, either full reels or single wilds in different spots. Gollum never added wilds to the reels. Other than that, it does have the Cinematic Spins, and the paytable is basically the same as far as I can tell. That being said, I gave it a shot and enjoyed it. 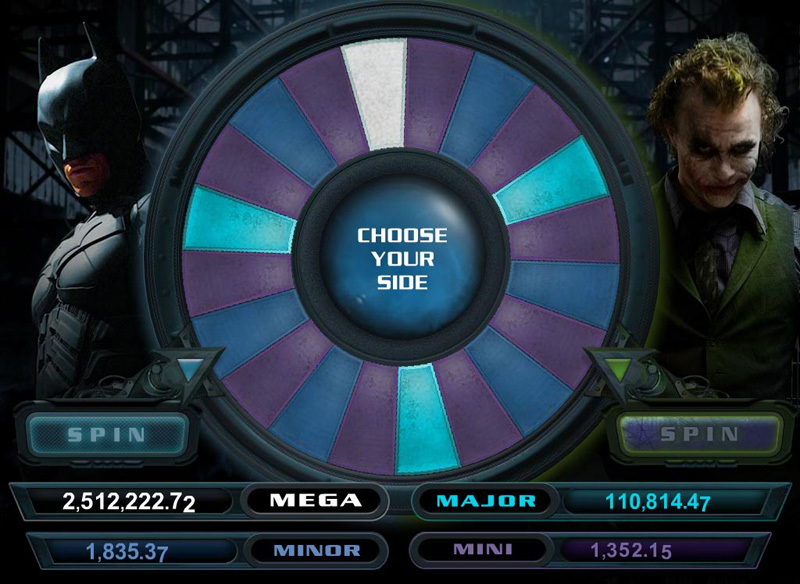 I seemed to get more playtime out of it than I did with the LOTR slot, and I’ve spun the reels over 1000 times on The Dark Knight so far. Club World Casino is hosting a number of freeroll slot tournaments this weekend, starting on Friday May 4th, 2012. All depositing players are welcome. There is lots of free money to be won with three big freerolls on Friday, Saturday, and Sunday, along with 15 “Rapid 5’s”. The Rapid 5’s are 5 different freerolls within 5 hours on each of those nights. If you’ve read my Club World Casino Review, you will know how much I like these tournaments. Most freeroll slot tournaments at online casinos give you the option to continue playing, but you have to pay to do so. That is NOT a free tournament and they shouldn’t be allowed to call them freerolls. What I love about these tournaments at Club World, is the fact that you only get one shot, and so does everybody else. All you have to do to play in these tournaments is sign up and make a deposit at Club World Casino, and then keep an eye on the Tournaments page to register for each one before the limited spots fill up. Winnings are not added to your account as a bonus, it is cash that you can withdraw. The founder of Bodog, one of the largest online gambling firms, has been indicted for operating illegal gambling business in the US that involves sports betting. Calvin Ayre has also been charged with conspiring to launder money. For the past few years, Ayre has been able to avoid US law enforcement as he continued to offer casino games and online sports betting to residents of the United States. The sports gambling site, Bodog.com, has also been seized by the government. On Feb, 22, 2012, Ayre and three other Canadians were indicted in Maryland by a federal grand jury. The four individuals have been accused of conducting illegal betting acts and money laundering. Many online gamblers from the United States were being paid with funds that were moved through various accounts in Europe and Canada and more than $100 million had been sent through checks and wire payments. Despite the fact that Bodog.com was registered in Canada, the indictment against Ayre is based on the movement of funds outside of the United States, and this was enough to prosecute the billionaire. The four accused individuals are currently facing a 5 year sentence for illegal gambling as well as 20 years for laundering money. In addition, Bodog.com faces a fine that could be as much as $500,000 for the same charges. While Ayre and his three partners are not in the US at this time, a warrant for their arrest has been issued. The federal indictment covers business that has been conducted from June 2006 to January 2012. In addition to more than $100 million being paid to online gamblers, the Bodog site is accused of spending more than $40 million on advertising specifically targeting US players and attracting them to the site. Since 2006, Ayre has been skirting and avoiding the laws on online gambling in the US. He was quoted in Forbes magazine, saying “Catch me if you can.” After years of taunting the US government, it all comes crashing down with this indictment and the seizing of the ever popular Bodog.com site. The investigation that eventually led to this indictment was comprised of an informant that once worked for Bodog as well as law enforcement officers working undercover, making wagers on sporting events and requesting payouts from Bodog. 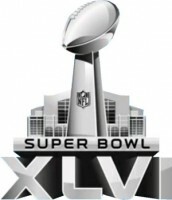 If you’re looking to place a bet on Super Bowl XLVI, I suggest checking out Sports Interaction. This online sportsbook is one of the few that I have found that focuses more on North American sports than European sports. Their main focus is Canadian sports, since Americans are not allowed to place bets with them, but the NFL and Super Bowl are popular here in Canada so they have put a lot of effort into making your betting experience easy and enjoyable for the event. After the Super Bowl, feel free to check out all their other betting options. If you’re a big hockey fan like me, you’ll enjoy the many options they have for betting on hockey all over the world, including junior hockey in Canada (OHL, WHL, and QMJHL). Sports Ineraction is licensed in Canada by the Kahnawake Gaming Commission. They are also great to use for betting on the UFC, CFL, basketball, soccer, several different types of racing, and pretty much everything else you would want to bet on. Buzzluck has recently launched a new and improved casino powered not by RTG but NuWorks software. The software looks and works very similar to the older platform, however, with new games and a new sleek look. Buzzluck was known in the industry prior to their closure for being a straightforward and honest casino and now that Club World Casino group took over it seems that it will continue to stay that way. Buzzluck reintroduced players to their fair gaming in a whole new way and the NuWorks software definitely looks promising for other casinos and operators. The layout, the games and designs are very detailed and mimic the feel of real land based casino games, which is sure to be a hit with players all over the world. Also, the difference between the new Buzzluck and the old is they are accepting USA players which will surely be refreshing for those USA players looking for a new place to play, along with new slots. The casino has only been available for a few weeks and is already making players happy. Message boards and casino portals are reporting fast payout times, awesome game variety and friendly customer service, which CWC is already known for. Other cool features are here as well such as a message box where the player can interact with their VIP host or the management directly through the casino. Get a 100% match on your first deposit – Sign up Now! Comp points are being offered as well and the wager to point ratio is fair and on point with the other casinos in the group. The cashier is super easy to use as well and players will feel that it is easy to use, no matter their experience with online gaming. There are plenty of reasons to give the new games a try even if it’s just for the welcome bonus alone. If you love RTG like games, Club World Casinos or just want a change in scenery; Buzzluck definitely delivers. Even almost 8 months later, Black Friday, the huge online poker scandal that took place in April of this year, is still making headlines in the world of online poker. While Pokerstars, one of the biggest brands in the takedown, is doing quite well without USA players, Full Tilt Poker has been taken down completely. The sweeping indictment that took place April 15th 2011 took down some of the biggest names in online poker including Pokerstars, Full Tilt, Absolute Poker and Ultimate Bet. Since then other poker rooms have followed suit and took their business out of the USA marketplace. It just got worse as time went on and we have seen more and more casinos and poker rooms removing themselves from the USA market and going all out to make sure they stay away from the watchful eye of the Department of Justice. It’s nowhere near over as far as the legislation is concerned, however, Pokerstars seem to be thriving more now than in the past. Full Tilt Poker was not as lucky. They have completely closed down shop to all players causing speculation of money troubles and legal woes. The truth is still not completely black and white and the details are being kept private as there is some hope that another brand will purchase FT in the near future. Some of the claims against FT are quite scary but I won’t go into detail until things are proven. Absolute Poker and UB.com, both owned and operated by the same management, are still going strong as well. It will take more than a criminal indictment to bring them down as we all have seen the brand behind the group in very compromising positions in the past and they still somehow made it in the industry without affecting their bottom line. As far as other poker rooms, there are still a few that are accepting USA players like Luvin Poker, Cake Poker and Carbon, however; there is a final blow to the industry coming very shortly. Bodog Poker is halting all business with USA players in the next few weeks and it will be interesting to see how they do without the huge USA player base. It all boils down to making it and survival and it seems that Full Tilt just couldn’t handle the pressure. Only time will tell just how much impact the industry will sustain due to the Black Friday events. For complete details keep checking back to TheCanadianGambler.com as updates will be added when they become available. Personally, I don’t think it’s a huge loss. I’m not much of a poker player, but I have heard many bad things about these big online poker sites and it makes me wonder how often the games were actually fair. It seems to me that you have a better chance of a fair game by playing at smaller online poker sites.